Sober Look: When traveling to Switzerland, make sure to bring some cash (or bonds). When traveling to Switzerland, make sure to bring some cash (or bonds). "Chiasso, Italy - Italian finance police on Friday reportedly arrested two men crossing into Switzerland carrying what looks to be around 135 billion dollars worth of US government bonds, potentially the biggest smuggling attempt in history. The Guardia di Finanza was not able to confirm if the bonds were genuine." What's the big deal? Some guys got caught with some bonds. "The men face potentially very stiff penalties should the securities be found to be genuine, as it is illegal to carry sums over 10,000 euros (around 14,000 dollars) into a non-EU country without declaring it." Stiff penalties? Earth to Earth Times - is there anyone there? 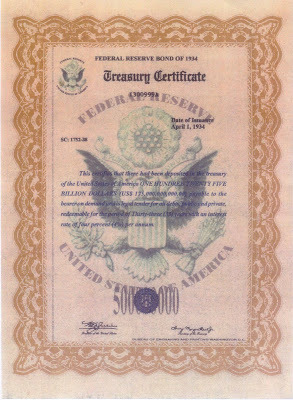 135 billion dollars worth of US government bonds. A couple of guys (supposedly from Japan)? This is either a massive hoax, the largest counterfeit operation in the world, or the largest theft/embezzlement ever. If the latter is true, this has to involve hundreds of people in high positions at governments and/or banks. The scandal will dwarf most financial scandals. This is every conspiracy theory buff's dream. Watch the blogs light up! Stolen TARP money, secret Swiss organizations (see post below), the Freemasons, embezzled online poker money, etc. Some of these theories could actually be possible - like the North Koreans forging treasury certificates in desperation (easier than forging currency). We'll be following this story closely as it develops.